New - Capability to connect to HRD via it's IP server, integrates into HRD's suite of software! Separate EQ settings for transmit and receive. Adjustable notch .aka "Feedback Destroyer"
Fully adjustable low distortion audio compressor. Able to set up a second serial port as a PTT using a very simple circuit. Very helpful with the simpler card card interface units. Fully programmable automatic CW identifier. Noise Reduction, Automatic Notch filter. Support for Virtual Audio Cables. Adjustable AGC time constants to make the receive audio more pleasant to listen to. Customize up to 6 audio filters for receiving. Unlimited number of user settings. Record and Playback of wave files. Complete and through help files. Schematic included for an interface. The RoMac 10 Band Equalizer 2012 coupled with your present computer's soundcard, affords you the finest Windows based digital equalizer made for the Amateur Radio community. Using professional techniques such as audio equalization will enhance the audio quality of your signal. The RoMac 10 Band Equalizer 2012 is like having a full featured audio studio in one package. Although the RoMac 10 Band Equalizer 2012 has many off the same features as the original Legacy RoMac 10 Band Equalizer. Under the hood, it's all brand new. Built with the latest .NET Framework from Microsoft, it is much less prone to audio glitches, and the user interface is cleaner and simpler. The RoMac 10 Band Equalizer 2012 has ten separate equalizer bands, with a generous plus or minus 16 dB of range and general bass and treble controls, to ensure that you have complete control over how your audio sounds. Variable high and low Pass settings for transmit audio. 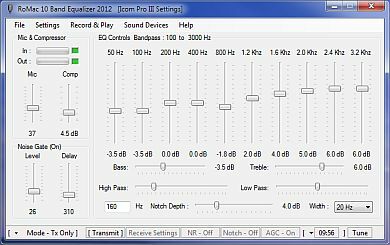 The RoMac10 Band Equalizer 2012 keeps separate equalizer settings for both your transmit and receiver audio. The audio compressor has been re-worked to ensure very low distortion levels, while effectively increasing your average power. Receive audio has 6 fully adjustable brick wall audio filters, automatic notch filter, and a very effective Noise Reduction. You can elect just to use the equalizer your transmit audio, or just the receive DSP filtering and equalizing, or both. Utilizing just the equalizer for transmit will require at least, an audio isolation transformer between your transceiver and the sound card. Using the equalizer for receiving only only requires an audio cable from your receivers audio output to the soundcard's Line In. Fully adjustable effects processing. Adding small amounts of reverberation can add "presence" to your transmitted audio. Fully programmable automatic CW identifier and tuning Pulser. 160 Hz notch aka "Feedback Destroyer". Up to 20 dB of attenuation at any frequency, with variable bandwidths of 10 Hz to 60 Hz in 10 Hz increments. A notch at 160 Hz is very useful to reduce the "boominess" when enhancing the bass (bottom end) when utilizing audio bandwidths that are typically used is SSB transmissions. Record and playback audio from your microphone or receiver audio. Great for setting up the equalizer to get that audio just right. Record the audio before or after any processing done by the software. Record off the air so a friend can hear how he sounds. Support for a Virtual Audio Cable enabling routing of a duplicate output audio stream to another soundcard application, or use a VAC for one or both of the input audio streams. Perfect for Flex Radios, EchoLink, SpectraPlus, Sound Card Scope, Skype etc. Support for using an external CAT program such as Ham Radio Deluxe control the TX / RX of the Equalizer software. Unlimited number of saved settings of equalizer controls. Keep your favorite settings for rag chewing, Dx'ing etc. Each setting is a couple of mouse clicks away. Selection of sound card sampling rates to enhance the compatibility of a wider range of sound cards, and a smoother, glitch free audio stream. Complete help files are included, making set up and understanding the software a snap. You'll be up and running in no time at all..
Why spend hundreds of dollars or even thousands of dollars, when the RoMac 10 Band Equalizer with your present computer and sound card will afford you great audio processing at fraction of the cost! The evaluation copy will run for 15 hours of cumulative time.